Skin diseases of children often are a challenge to a doctor. A certain communication with a child and his parents is necessary. The spectrum of skin problems in childhood is wide including genodermatoses, genetic syndromes, immunodeficiency, allergic diseases, autoimmune diseases, psoriasis, oncodermatology (nevi, melanoma, lymphoma etc. ), vascular malformations and tumors, infectious skin diseases, sexually transmitted diseases, diseases of sebaceous gland and others. Acne is one of a most common disease of children, especially in their adolescence. In a most cases acne disappears in the adulthood but in up to 20% of cases it persists even after the age of 25. Eichenfield et al. divides acne into neonatal acne (from birth to 6 weeks), infantile acne (from 6 weeks to 1 year), mid-childhood acne (1-7 years), preadolescent (7-12 years or before menarche in girls) and adolescent (12-19 years or af?ter the menarche in girls) acne . Is quite common and affects about 20% of all newborns . In a pathogenesis of neonatal acne mother’s and neonate’s androgens play an important role. Also the colonization with Malassezia furfur is common. 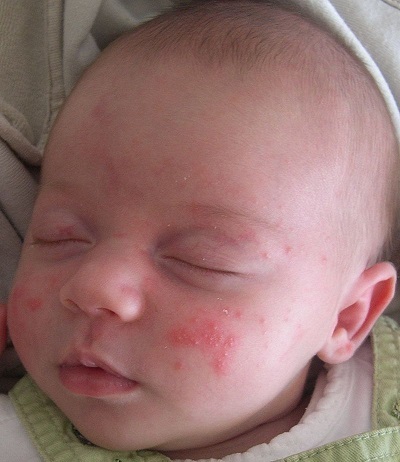 Usually neonate acne is mild and no special treatment is needed. Antifungal local remedies might me used . Is quite rare and can be a sign of hormonal dysfunction. Infantile acne can predispose more severe forms of adolescent acne . Acne is also rare. In this case adrenal, gonadal pathology and androgen secreting tumors should be excluded. In case of no hormonal abnormalities local treatment usually is sufficient . Is quite common and hormonal function usually is normal. The prevalence of preadolescent acne is high (about 70%)  Preadolescent acne demonstrates the role of other than hormonal factors to the pathogenesis of acne. In this case genetic factors, stress, the impact of a dietary factors, body mass index should be evaluated . The highest prevalence of acne is during the adolescence [1,4]. The severity of the adolescent acne varies from mild to very severe. Although the mild form of acne is the most common  severe once demands very careful evaluation of the skin and also of a psychological state. Some studies show that the acne impact on the life quality is similar to impact of other chronic diseases such as asthma, epilepsy, diabetes or even cancer . Doctor’s duty is not just to diagnose acne and establish its severity but to determine the individual influence of this disease to patient’s psychological and social life. It is not surprising that even the mild forms of acne can result in a high impairment of life quality, social isolation, and even suicidal thoughts . In this case more aggressive treatment has to be introduces right away. The study of Hahm and colleges shows that acne treatment with oral isotretinoin improves the life quality of the patients significantly . The other important issue of pediatric acne is young people’s beliefs and perceptions of this disease. Many adolescents suffer from acne, but a majority of them do not see acne as a disease. Young people consider acne as a temporary skin condition that will go away after the adolescence and misuse acne treatments . Over the counter products is the most common choice of children and adolescents to treat their acne even in severe acne cases. The other problem is that choosing the treatment for their acne children rarely consult a dermatologist [6,7]. Usually the treatment of acne is based on child’s opinion, less often treatment is offered by a family member, friend, cosmetologist or pharmacist . In summary, acne is one of the most common skin problems in children and especially adolescents. Acne is not a temporary skin condition, but serious skin disease and should be managed by a specialists including education of a patient and their parents, evaluation of psychosocial impairment and adequate treatment. Eichenfield LF, Krakowski AC, Piggott C, Del Rosso J, Baldwin H, et al. (2013) Evidence-based recommendations for the diagnosis and treatment of pediatric acne. American Acne and Rosacea Society. Pediatrics 131: 163-186. Jansen T, Burgdorf WH, Plewig G (1997) Pathogenesis and treatment of acne in childhood. Pediatr Dermatol 14: 17-21. Karciauskiene J, Valiukeviciene S, Gollnick H, Stang A (2014) The prevalence and risk factors of adolescent acne among schoolchildren in Lithuania: a cross-sectional study. J Eur Acad Dermatol Venereol 28: 733-740. Mallon E, Newton JN, Klassen A, Stewart-Brown SL, Ryan TJ, et al. (1999) The quality of life in acne: a comparison with general medical conditions using generic questionnaires. Br J Dermatol 140: 672-676. Fried RG, Wechsler A (2006) Psychological problems in the acne patient 19: 237-240. Hahm BJ, Min SU, Yoon MY, Shin YW, Kim JS, et al. (2009) Changes of psychiatric parameters and their relationships by oral isotretinoin in acne patients. J Dermatol 36: 255-261. Karciauskiene J, Valiukeviciene S, Stang A, Gollnick H (2015) Beliefs, perceptions, and treatment modalities of acne among schoolchildren in Lithuania: a cross-sectional study. Int J Dermatol 54: e70-e78.